How to Make PMS a Thing of the Past? Ladies, two weeks before the onset of your period, do you ever experience the wrath of Premenstrual syndrome (PMS), which includes mood swings, tender breasts, food cravings, fatigue, irritability and depression? If yes, you are not alone. According to Mayo Clinic, approximately 3 out of 4 women experience some variation of PMS. During this beloved time, most of us rely on pain killers and maybe some extra support from a heating pad. However, why treat the symptoms of PMS when you can lessen its overall severity with simple everyday changes. Yup that’s right, changes in diet and lifestyle can make PMS more tolerable (insert round of applause)! Jot down your symptoms in a notebook or if you have an iPhone, download a period tracker app. This will enable you to identify causes, timing, and severity of symptoms, which will help you to intervene with strategies to lessen them. Be mindful, severity of symptoms is what distinguishes PMS from Premenstrual Dysphonic Disorder (PMDD). The symptoms of PMS and PMDD are very similar, except PMDD causes major mood swings that can disturb your work and destroy your relationships. In a more visual comparison, PMS is Bruce Banner, while PMDD is his alter ego, the Hulk. Eat six small meals at regular three-hour intervals, high in complex carbohydrates (fruits, vegetables, whole grains). This helps to provide a steady stream of blood glucose level and energy. Largely lessen and eliminate use of caffeine, alcohol, salt, fats, and simple sugars to reduce bloating, fatigue, tension and depression. Take daily supplemental vitamins and minerals to mitigate some PMS symptoms. Studies have shown that vitamin B6 (50-100 mg), magnesium (300mg), vitamin E (400 IU) and calcium (1200 mg) can alleviate irritability, fluid retention, joint aches, breast tenderness, anxiety, depression and fatigue. Be sure to consult with your doctor prior to taking any medication for PMS. Tip 3: Step your endorphin levels up! Endorphins are the body’s natural pain killers and mood elevators that are released during exercise. It is recommended that you should treat yourself at least three times weekly with 30 minutes of brisk walking, cycling, swimming or other aerobic activity. 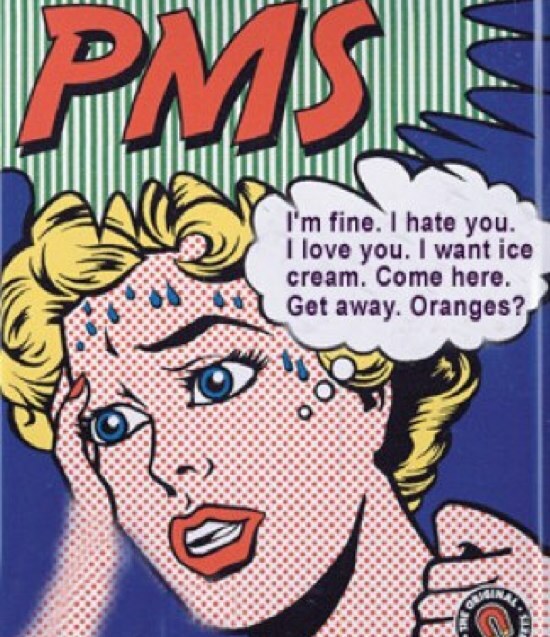 Stress can exacerbate PMS symptoms. Beyond exercising, the following things can be done to reduce stress: adequate amounts of sleep (7-8 hours per night), progressive muscle relaxation or deep-breathing exercises to help reduce headaches, anxiety or trouble sleeping (insomnia), and yoga or massage to relax. As mentioned, PMS symptoms can occur within 2 weeks of your period. While lifestyle, diet, and exercise changes can be challenging, I GUARANTEE your body (and the people around you) will thank you for your efforts! And for your viewing pleasure: the PMS anthem. I remember in the 6th grade getting a handout that had an image of a girl playing soccer, claiming that exercise would alleviate the difficulty associated with PMS. I come from an obese family, yet I am now very fit and healthy and well-educated in the Health/Exercise Science field. I have had great coaches and some good influences in my life (outside of family, which was not always the best of examples in terms of health)… but I honestly think the reason I adopted a healthy lifestyle was because of that flyer. You never know when information is going to change someone’s life for ever, for the better. So this was an excellent blog. It just may be the winning ticket.